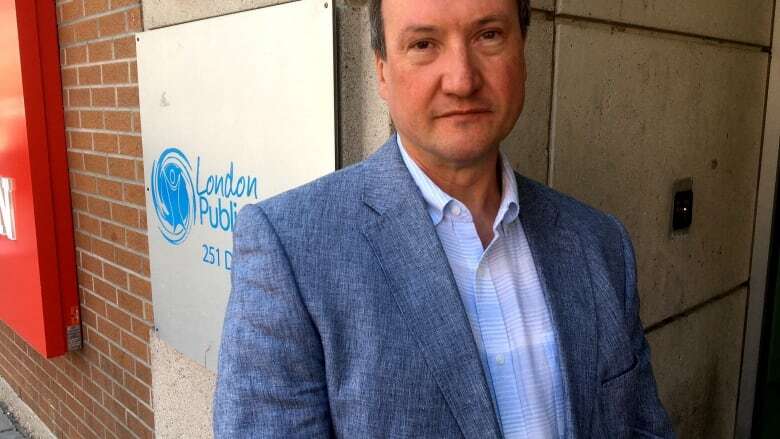 Peter Bergmanis, chair of the London Health Coalition, said Susan Truppe is the only candidate among all the major parties who has failed to commit to participating in a debate on health care. The London branch of the Ontario Health Coalition is “calling out” the Progressive Conservative candidate for London North Centre for failing to confirm her attendance at a debate on health care issues scheduled for Thursday evening. The group held a news conference Wednesday to point out that Susan Truppe is the only candidate among all the political parties who has not committed to participating in the forum. “All the other political parties are invited and have accepted,” said Peter Bergmanis, co-chair of the London Health Coalition. Bergmanis said the group became concerned when the Ford campaign came to London North Centre last week and used the backdrop of a private medical clinic to announce plans to cut wait times in public hospitals. “Does that mean they’re about more privatization and cuts to the public services we have?” said Bergmanis. Bergmanis said the health coalition is aware that many PC candidates have skipped candidates meetings across the province during the campaign. Last week CBC News reported that PC nominees for the June 7 election have skipped meetings in at least 25 ridings throughout Ontario. Candidates from other parties have missed some debates as well, but the PC absences have been wider in scope. Bergmanis said the pattern should concern voters. Truppe’s office has not responded to calls from CBC asking whether she will appear at tomorrow’s night debate. The forum will be held at Wolfe Performance Hall at the London Central Library starting at 7 p.m.